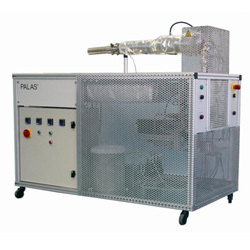 The DSP Series offered by CH Technologies, manufactured by Palas GmbH, is a large scale soot generator designed to simulate combustion products. DSP functions by combusting a fuel gas in the presence of air. Major features of the DSP Series include the ability to adjust the mean particle size of soot as well as the particle concentration. This is achieved by using a high-tech patented burner. The DSP Series easily achieves the very high concentrations and mass flow rates required to test diesel soot filters in filter efficiency tests. Designed with safety in mind, the DSP Series is equipped with a comprehensive safety package.